The latest Mercedes-Benz S-Class (W222) was launched in 2013 and is now offering a facelift version with new engine and Magic Body Control. 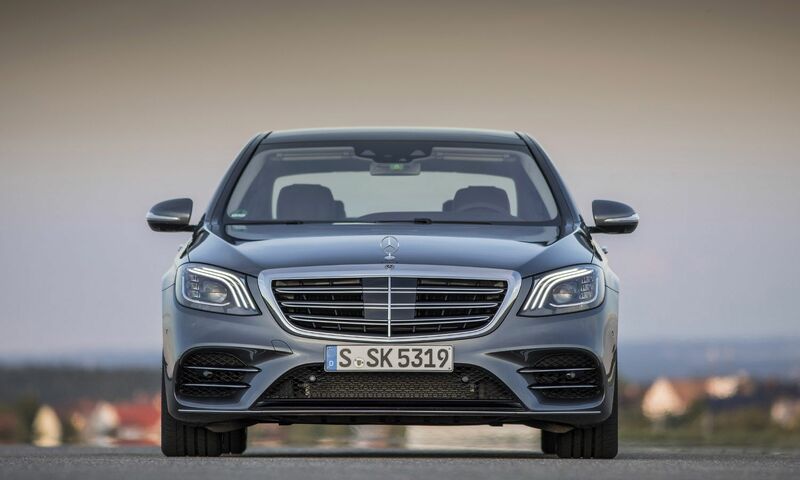 Take your pick from five different models: Mercedes-Maybach S650 Facelift, Mercedes-Maybach S560 Facelift, Mercedes-Benz S S500 Facelift, Mercedes-Benz S320 Facelift and Mercedes-AMG S65 Facelift. To find out what's new, swipe through our slideshow. The new exterior comprises a new radiator grille, LED tail lamps with crystal-look tail lamps, and front bumper with pronounced air intakes. The lower bumper section has been redesigned with integrated visible chrome tailpipes. The new S-Class Multibeam headlamps are available with Ultra Range high beams. The extended ambience lighting in the S-Class offers 64 different colours with individual settings to suit one's mood. The Energizing comfort control in the S-Class links various comfort systems in the vehicle together including fragrance, seats (heater, ventilation, massage), the wall heating as well as lighting and music. The vehicle can even speak with its Linguatronic voice control system to control the interior comfort functions. The Magic Body Control is a new suspension system comprising Active Body Control, Road Surface Scan and the curve inclination function. The Road Surface Scan will scan up to 15 metres in front of the vehicle to detect an image of the road contours ahead. Using the information extrapolated from the stereo camera, the control unit will constantly calculate the best strategy to overcome uneven road surface in order to deliver a very smooth ride even over bumps. In Active Body Control, the four suspension struts are fitted with hydraulic cylinders (so-called plungers) in order to adjust the force in each strut individually. This means that the system can almost completely compensate for lifting, rolling and pitching movements of the body. The new Mercedes-Benz S 500 is equipped with the new 2999CC in-line six cylinder engine, which generates an impressive output of 435 hp and 520 Nm. Over a short period, the Integrated Starter Generator makes a further 250 Nm of torque and 16 kW of output available. Compared to its predecessor with a V8 engine, CO2 emissions have reduced by around 22 per cent. In short, this new engine delivers the performance of an eight-cylinder with significantly lower consumption. The new biturbo is among the world's most economical V8 petrol engines, and consumes up to six percent less fuel than its predecessor. This is achieved by deactivating four cylinders of the new V8 under partial load. The turbochargers positioned in the V of the cylinder banks is another special feature. The AMG 4.0-litre V8 biturbo engine with cylinder deactivation replaces the previous 5.5-litre V8 biturbo. Despite a lower displacement, the new engine generates 612 hp for Mercedes-AMG S 63 4MATIC.